A family flee violence in Kamonia, Kasai province, Democratic Republic of the Congo. In light of the worsening conditions, the UN agency and humanitarian partners have declared the situation in DRC to 'level 3' – the highest level of emergency. Bettina Luescher, for the World Food Programme (WFP), said the agency is scaling up capacities in the provinces of Kasai (proper) and Kasai Central – the hardest-hit of Greater Kasai's five provinces, with a threefold increase in the number of severely hungry people over the past 18 months. Two thirds of the severely hungry are in Kasai province alone, she added. Of the $236.2 million required for the needs of refugees, IDPs and other people of concern in the DRC, only $49.7 million has been received so far – a fifth of the amount required. 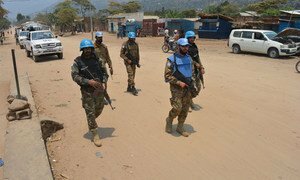 Responding to the worsening security situation near a major town in eastern Democratic Republic of the Congo (DRC), the United Nations mission in the country has deployed peacekeepers to deter any attacks on the city and to prevent escalation in clashes.